is there a specific policy against this practice, that would cause apple to reject these apps? I will not argue that this example is scummy, but I see them trying to address one frustration of the store: a majority of users use it for tech support and bug reporting. They’ll give a 1 star review because something isn’t working, or you’ve changed something they like. I personally don’t like any of these devices, but they are based on Apple’s slow movement on improving the app review process. In an ideal world, Apple would make a system-wide review requestor that can be opted out of globally. I don’t see how positioning the user to be more inclined to leave a positive review than a negative one OR getting direct feedback rather than a negative review is AT ALL more “scummy” than just asking for review in the first place. It’s just copy writing, man. Perhaps my opinion of the rest of humanity is just higher than yours, but I really don’t think anybody capable of using an iPhone at all is so abysmally stupid as to think that a button labelled “rate us highly” means you need to look for another button to rate them poorly. Anybody inclined to leave a negative review knows how to do it and can still do it whether they’re invited to review the app or not. No developer should feel obligated to frame copy in such a way as to invite behavior detrimental to their own livelihood! That’s just stupid. Unless you monitor your reviews, it’s simply more effective to send feedback if you have an issue with an app than to write it in a review. I don’t see what’s wrong here: if the user doesn’t like the app, at least they’re given the possibility to send feedback to the app developer. It’s better than nothing. 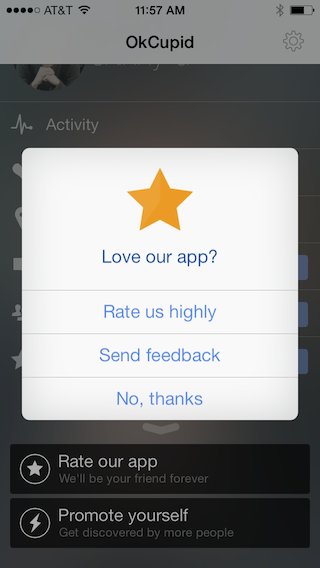 Title: Do you like our app? I think this comes out of a mild frustration with dealing with customers that leave reviews. From the Google Play side, we can communicate with the user, post responses to reviews, and help them out personally. In Apple’s world, we don’t have the option to offer help or support before they get frustrated and leave a nasty review. 1. This isn’t a pop-up that interrupts what I’m doing. I actually have to select that option from the menu, rather than be pestered by it at random intervals. (Perhaps OkC do pester users like this, I don’t know, but assuming they don’t this seems like a *nicer* way to handle rating-begging, not a scummier way). 2. In your screenshot the ‘Rate our app’ button is fully visible. In fact, by default it is tucked away behind the other ‘Promote yourself’ button. A small detail perhaps, but it is at least one degree less beggy. 3. Apple’s review system is a terrible way to communicate with a developer, especially if you want feedback. That OkC want to divert feedback like ‘please add this feature’ or bug reports AWAY from the app store does not seem unreasonable to me. Framing their button as ‘Rate us highly’ may be a little bit manipulative, but I don’t really blame them. Happy customers are generally unlikely to bother writing reviews, while unhappy customers are much more likely to. Developers are only trying to combat this imbalance and OkC has struck a balance that won’t piss off otherwise indifferent users. One reason this tactic is used is that so many people don’t use the review system as it should be (to offer their opinion- either to encourage other users, or warn them off) they use it to ask for a refund,which will never happen just from a review, or to ask a support question, which the developer will be unable to answer through the review system, or (often) to complain about something missing that the app actually already does. If they contact the developer, they could be helped, but if they leave a review there is no way for the developer to help them, and the inaccurate, bad review stays around forever. I don’t use a “rate me” pop up in my apps, but I have a support button in the app from the start, and the ‘rate’ button only appears alongside it after a user has used the app for a little while. This seems fair, as a way to counterbalance the inherent bias that people are always much more likely to be motivated to leave a bad review than a good one. This stuff passes Apple’s review process because Apple doesn’t hand-test apps anymore. Last Christmas I had an app approved that had a last minute bug slip in that caused it to crash on startup if you ran the app more than once. Facebook’s app is even worse – its “Send Feedback” option doesn’t actually do anything – except reactivate the popup a few minutes later. Thinking about this, is it really so bad? I would have to think that when users are going to rate an app poorly, it might well be because of a feature request or a bug. Why rate an app poorly, when you can get in direct contact with the developer? If you do really want to leave a negative review, you still can, you’re not being prevented from doing so. A related issue is games that ask you to rate them when you’ve accomplished something. For example, Scrabble asks when you get a bingo (or used to, anyway). People who have just gotten a little positive reinforcement like that are presumably a lot more likely to rate highly. I removed my review nag when I pushed my Sleep Sounds 7.0 for iOS7. I had already achieved 4.5 stars, which was pretty good. Developers need a fairly decent star rating, which is first published at 5 reviews I believe. After that, there is no reason to get more reviews. In fact, nagging for reviews can actually push your rating down.